Preheat oven to 325 degrees Fahrenheit. Spray a 9" round cake pan with cooking spray. Dust cocoa all over the inside of the pan, tapping evenly to distribute. Cut a piece of parchment paper to fit in the bottom of the pan. Insert in pan and spray with cooking spray. Drain and rinse beans in colander. Shake off excess water. Place beans, 3 of the eggs, salt, and vanilla in a blender and blend until smooth with no bean clumps! In a mixer, beat butter and sweetener until combined. Add remaining eggs, one at a time, beating between each addition. Add bean mixture to butter mixture and mix. Finally, add cocoa powder, baking soda, and baking powder. Beat on high until smooth, about one minute. Pour mixture into cake pan and tap firmly on counter several times to bring air bubbles to the surface. Bake for 40-45 minutes. Cake is finished when top is firm to touch. Cook for 10 minutes before flipping onto wire rack and removing from cake pan. This cake truly is best if you make it 24 hours in advance, let it sit out, and frost right before serving. 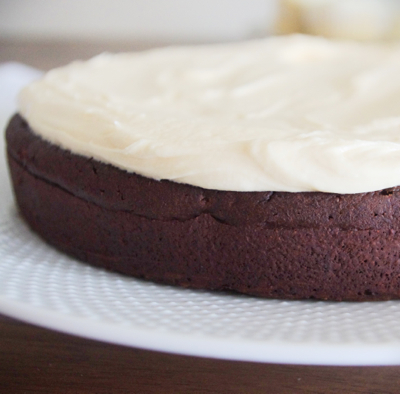 My favorite frosting is a basic buttercream with a little caramel and sea salt thrown in! Yum! Finding gluten free treats is hard. We are always on the hunt and our have to be sugar free, too. This looks great.